Having suffered from a serious carb-overload at the weekend, I once again turned again to this month's issue of BBC Good Food magazine to get me over my bread- and pasta-filled stupor. The recipe is from a promo-ad for a particular brand of toothpaste. I only paid attention to this small detail when I realised that the calorie count wasn't at the bottom - a sign from the Good Food team that either it's an endorsed, therefore untested recipe or that the calorie count is so stupendously high that if you have to ask what it is, you really shouldn't be eating it. I still try to kid myself that I need the carbs for running. Except that I don't run half as much as I used to which is why I'm now struggling so hard to find the right combination for weight loss. Despite never going back to my 'Jabba the Hut' days, I still yo-yo up and down by a couple of stones depending on what lemons life cares to throw at me. And, indeed, what I choose to do with those lemons. If things aren't going well, I'd be more likely to make a tart au citron and eat the lot than lemonade. People who know the un-photoshopped version of me (my husband is a photographer so I look nothing like my profile picture in reality), and didn't know me back in my more active running days are still surprised when I tell them I run. Just this morning, one of the guys I work with looked me up and down and said 'You run? Really?' and stifled a snigger. The comment had been initiated by me turning up to work in running shoes. Normally I'm only ever seen in the office in heels (or barefoot). The joke was that I'd run the 35 miles to work through the snow because nobody seriously believed that I do actually run. In fact, in just five weeks, I'm running the Bath Half marathon for Guide Dogs for the Blind for the second time. Last time was 2008 when I finished in 2h 13m. This time, I'll be happy to get round in 2h 30 as I've only really been back running for five weeks, but I'm running for charity which is the only thing keeping me on the case at the moment. Anyway, today's tea was the punishment for the weekend crime of a huge plate of sausage pasta with garlic bread (I was desperate for a dinner that wasn't something new) and consuming the best part of the Giraffe loaf I baked on Saturday. There's nothing healthier than a plateful of lentils. The recipe called for puy lentils but scouring the shelves of our local Tesco, I could only find red or green lentils. A quick Google revealed them to be pretty much the same. Mr Crisp would be pleased to know though that my tin of green lentils was significantly cheaper than if I'd gotten proper puy lentils on my weekly Ocado shop. Whilst reading up on lentils (thrilling), I was also amused by the comment that they were good to bulk out regular recipes rather than eating a plate of just lentils which can seem endless. When I picked up the can this evening, I was quite hungry and figured I could probably polish off most of them. That was until I drained them. Opening the can was something akin to opening a tub of rice from the Chinese takeaway. It looked all tiny and innocent until the lid was removed and suddenly the contents expanded to ten times the volume of the original container. I swear the quarter-tin that I needed for the recipe was enough to feed a family of four for a week. Overall, the recipe did feel pretty healthsome, even with a huge lump of grilled goats cheese on the top. I'm not sure about the flavours. I wouldn't call it spicy per-se as it uses smoked paprika. It was tasty but needed seasoning that the recipe didn't call for. And if I'm honest, I would've probably preferred the smoky paprika flavour to be coming from some small chunks of crispy chorizo. It was a bit like eating something made from Quorn. It had that 'meaty' taste, but without actually eating meat. Kind of a little fake and disappointing. Anyhoo, if you're looking for something healthy and/or veggie, you could do a lot worse than this dish. Heat oven to 200c/180c fan/gas 6. Place the beetroot wedges in a roasting tin, toss in 2 tbsp of the olive oil and add the cumin seeds and thyme leaves.. Roast for 30-35 mins until tender. Heat the remaining oil in a large frying pan and saute the spring onions and celery for 3-4 mins. Grill the goat's cheese until golden and bubbling. When the beetroot is cooked, add to the lentils with the spinach and parsley, and mix to combine. 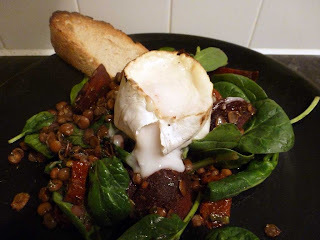 Divide the lentil and beetroot mixture between 4 plates and top each one with a slice of grilled goat's cheese. Serve immediately.